A classic style, this 3-wire frame captures this stone securely without overpowering the stones beauty! With the solid foundation at the bottom and the double rabbit ear bail at the top, we use the remaining wires to enhance the top and end the wires in a decorative way! 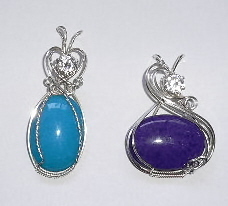 This style is suitable for beginner and intermediate wire wrappers. We start with a simple formula that works for every stone regardless of the shape or size, and work our way to the top where we create double rabbit ear loops for the chain to fit, and then on to the many variations to decorate the top. The Traditional Pendant class utilizes sterling silver wire with a flat backed, smooth topped stone and an optional clear faceted stone at the top of the double rabbit ear bail for the chain. Each student gets to decide on what they would like to do with the top wires. There are suggestions but this is completely up to what you want to do! To add beads or not, to add a dangle or not, is completely your choice! Find out how easy capturing your treasures in wire can be! ​This class is from 10 am to 4 pm and includes all you need to complete TWO of these pendants, 1 wire project and 1-2 cool down projects depending on time. You are welcome to bring your own stones dependent on instructors approval. You will need to bring a lunch. This class is from 10 am to 2 pm and includes all you need to complete this pendant, one wire project and 1 cool down project depending on time.